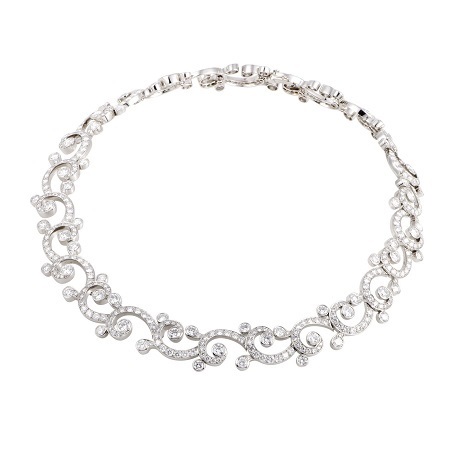 A diamond necklace is a sign of beauty and sophistication. 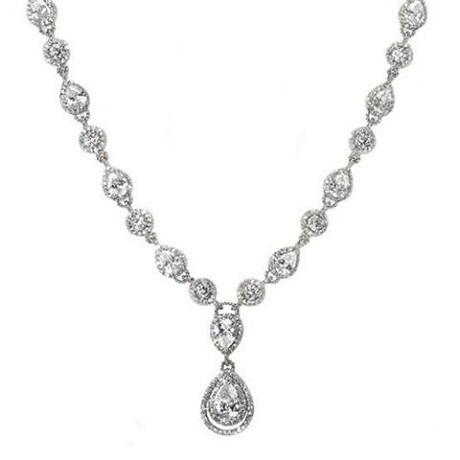 Known the world over for their elegance and decadence, diamond necklaces are great for a range of situations. Whether you want to show a loved one how much they mean, celebrate a birthday or anniversary, or need a new show stopping piece for special occasions, our guide is ready for it all. No matter how big or small, every piece of jewellery that you wear shows a personal facet of yourself to the world. It is an extension of yourself, your mood, your personality. This is also true in the case of necklaces & pendants. Whether dressing up a casual outfit or for a fancy night on the town, a necklace is a wonderful accessory. From simple to ornate, We show you many variations of necklace and pendant styles. Just like diamonds themselves, diamond necklaces are complex creations, that's why they're so valuable and popular. Because there are so many variables to consider when designing or choosing a diamond necklace, there's almost infinite choice. To start, you're best deciding whether you want a diamond necklace or a diamond pendant. A diamond necklace is constructed with gold or platinum links and set with diamonds either partially or all the way around the neckline. A pendant is an adornment designed to be suspended from either a chain or cord. A pendant features a bail style, which is an arched (often oval, teardrop, or d-shaped) metal component by which the pendant hangs. It is meant to slide onto the chain rather than being soldered to it so that the pendant moves independently from the chain and is not a permanent part of the chain or cordlike a diamond necklace. A diamond necklace can have just one central diamond stone or a number of gemstones with the largest in the middle. They're incredibly sophisticated and are most often saved for special occasions. Very similar to a traditional diamond necklace, with one difference, your diamond stone will dangle from the chain, rather than being incorporated as its own link. Diamond pendants are often considered as great for everyday wear as well as special occasions. Diamond pendants, defined as "hanging ornaments," come in a variety of settings and styles, each with their own characteristics. They are always in fashion, can be dressed up or dressed down, and can be as conservative or as risque as you desire. Pendant styles also vary and can include solitaire, slide, and locket. Choosing the style is not the only component to buying a necklace; you should also consider the length. 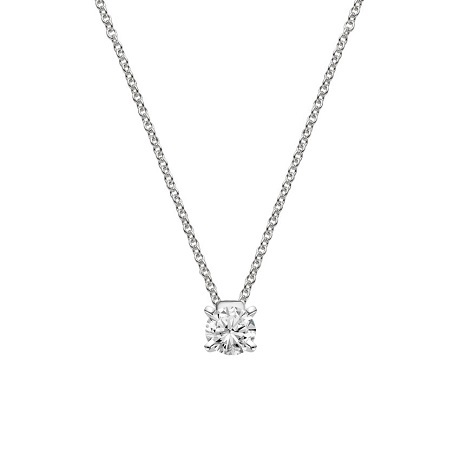 A diamond tennis necklace is a stunning addition to anyone's collection. These pieces are crafted in gold or platinum and are offered in many carat weights. 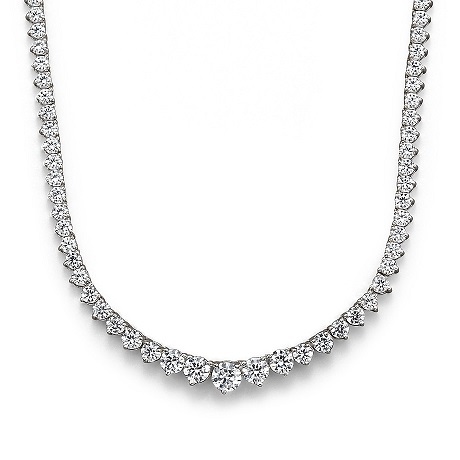 This style features similar sized diamonds all the way around the necklace. 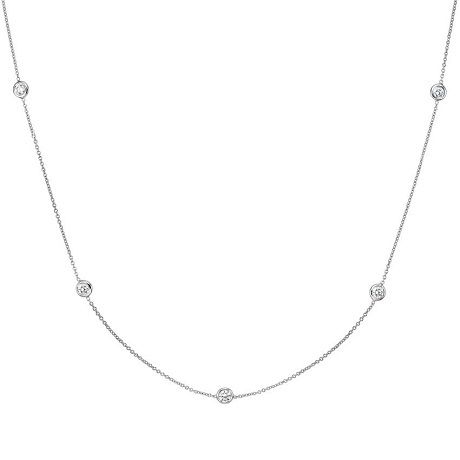 A classic graduated diamond line necklace that lays comfortably and fluidly on the neck, the tennis necklace moves with you without turning or flipping. In contrast, a graduated necklace style starts with the largest stone in the center and recedes with gradually smaller diamonds. Fancy collections include the Red Carpet diamond necklaces which are sophisticated pieces featuring a double or triple row design and the Fashion diamond necklaces which are more avant-garde in style. Chain necklaces are delicate pieces that are usually made of gold or silver. A choker is a close fitting necklace worn around the neck. Chokers are typically 13-15 inches in length. Chokers can be made of a variety of materials, including velvet, plastic, beads, leather and metal. A collar is a necklace that lies flat to the body rather than hanging freely. 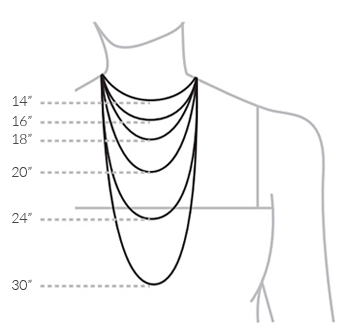 Collar necklaces are 14 inches in chain length. A lariat is a very, very long variation on the rope, without a clasp, often worn draped multiple times around the neck; the ends can be crossed over, looped, or knotted in various ways. This type of necklace sometimes incorporates a loop at one or both ends to allow it to be worn in the style of a lasso, or it may be worn doubled over with the ends passed through the loop formed in the middle. Long station necklaces are typically 22-42 inches in length. Statement necklaces are bold, intentionally large pieces with bulky pendants and ornate details. A diamond necklace is a great investment, so be sure to consider whether your necklace should be for all events or something reserved for special occasions. If going for less formal, look at a diamond pendant necklace. These pendants come in a variety of styles and price points. For a more formal look, a detailed diamond necklace, a glamorous red carpet necklace, or classic diamond strand necklace are lovely options. These diamond strand necklaces are set in shimmery gold or platinum and surround the neck. Portraying the iridescent gleam of the ethereal stones, diamonds, in its complete glory, these solitaire pendants are excellent gift to win the heart of your beloved. Featuring efficiently chiseled different diamond shapes, these solitaire pendants take elegance and grace to another top notch. Extremely liked and very much in fashion, the halo pendants fuse the classic vintage style with a sleek modern look. Highly admired since archaic times, the halo diamond pendants can never grow out of style due to its heightened shimmer and fine setting that secures the tiny diamonds. A diamond journey pendant is a personal piece of jewellery that can symbolize a journey through life and love. It is a great way to celebrate a major milestone such as a graduation or anniversary. A multi stone diamond journey pendant has become a jewellery collection essential. There is no better way to symbolize your growing love as you journey together. 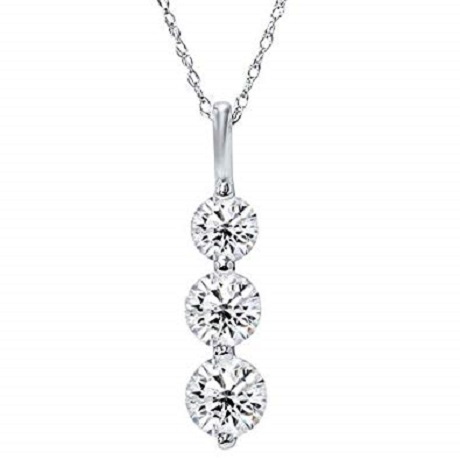 A dazzling diamond pendant perfect for casual and formal wear. Three stone pendants represent your past, present and future as a couple and are a wonderful alternative to the classic solitaire pendant. 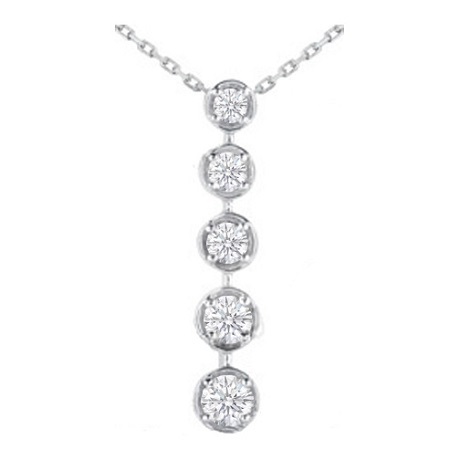 Three stone diamond pendants feature three diamonds or gemstones set in a continuous vertical row. Typically, the stones increase in size from top to bottom. If you are interested in buying jewellery as a set, three stone pendants coordinate beautifully with three stone earrings or a ring. The three diamond look is very chic. If you want to mix it up, simply add your favorite gemstone for a vibrant and unique accessory. A pendant necklace comes with a chain which matches in metal type. 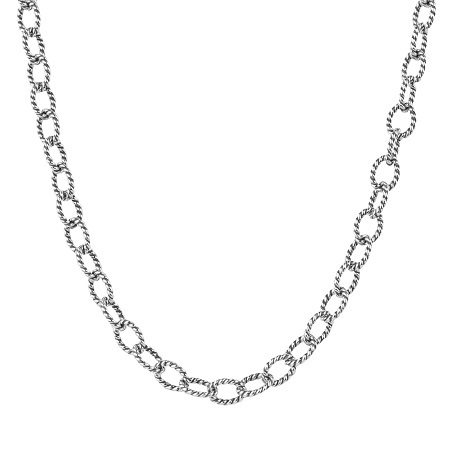 The standard chain length for a pendant is 18", however, you can also order a 16", 17" or 18" chain. 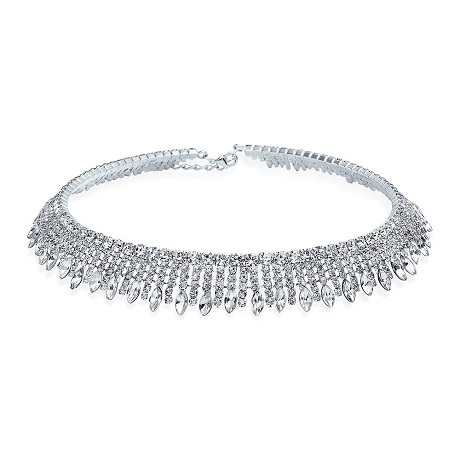 If you are ordering a diamond necklace, it should hit the center of your neckline. 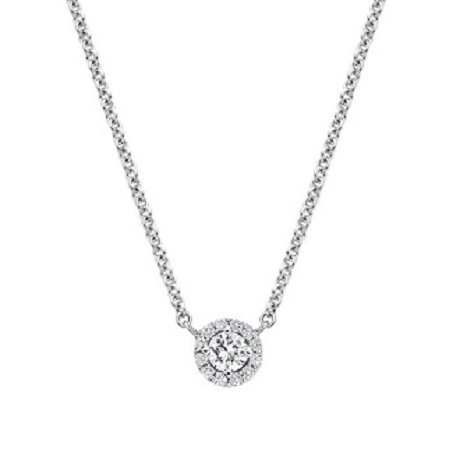 The standard length for diamond necklaces is 16" however, the length can be adjusted simply by adding small links to the back end of the necklace. In general, the three main categories for diamond necklace lengths are: the 'standard' length ( 16" ), the 'princess' length ( 18" ), and the 'opera' length ( 24" ). Many reputable jeweller's offer an engraving option for many of their necklaces and pendants. Designing personalized jewellery, like an engraved necklaces and pendants, demonstrates extra love and thoughtfulness. You can easily engrave a pendant or necklace with a special word, phrase or date. The best part? These personalized pieces often remain in the family for years and even generations. Beautifully engraved necklaces and pendants often become a keepsake or family heirloom for many years to come. 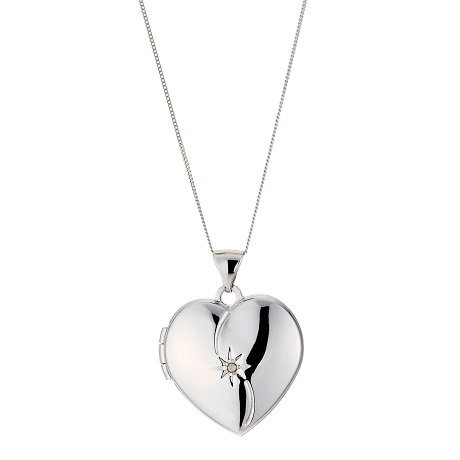 From engravable diamond disc pendants to colored gemstone heart pendants, engraved necklaces are a truly meaningful gift for mom, dad, siblings, grandparents, friends, partners and more. Having a necklaces and pendants custom engraved ensures your gift is thoughtful and unique. You can opt to etch a name, phrase, date or any other special symbol on your necklace. After all, it's about designing a piece of jewellery that will carry personal meaning. From monogram styles to photo lockets, the options are nearly endless when it comes to personalized necklaces and pendants. Consider the style of jewellery your loved one typically wears. Do you see them wearing yellow gold or sterling silver? Do they prefer long necklaces or ones with short chains? No matter what, be sure to review a few styles before designing the perfect gift. • Birth of a child. • Other special celebration (i.e. job promotion, retirement).